Is this an Apple Store or a McDonald's? The similarities are more than skin deep. 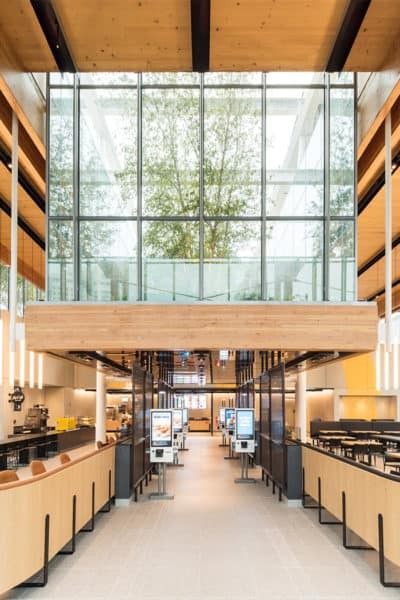 The McDonald’s location strives to be as environmentally friendly as an Apple Store. The 19,000-square-foot steel-and-wood-timber restaurant was inspired by “McDonald’s commitment to sustainability,” according to a statement from the company. There are more than 70 trees on the ground level, and a vegetated roof space. 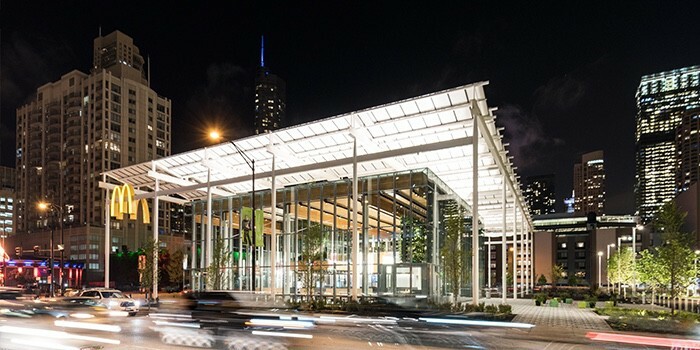 Trees are an important part of the new Chicago McDonald’s design. This should sound familiar. Trees are a notable part of the Apple Store in San Francisco‘s Union Square. And the new Seattle Apple Store has a roof planted in sedum flowers. The huge restaurant chain put a solar panel array in its new Chicago location to offset part of the restaurant’s non-renewable energy consumption. Apple is run on 100 percent renewable energy. The restaurant does have a couple of features Apple Stores don’t: it operates seven days a week and 24 hours a day, serving both drive-thru and dine-in customers. Apple has to be accustomed to other companies copying it. But it’s usually Samsung or Huawei, not a fast-food chain. Still, companies know a good idea when they see it.